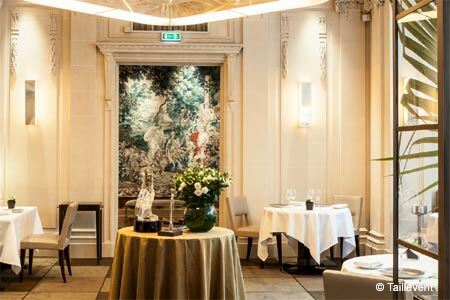 Taillevent's remarkable wine cellar and service complement the dégustation menu, which is a good value for Paris. : Although this venerable house did not really show any wrinkles, because it will probably never display the signs of a great age, the décor has been a tad modernized. The refurbishing highlights even more the sheen of the old woodworks. But with its clubby and subdued atmosphere, Taillevent will always be Taillevent, a restaurant meant for the well-behaved and well-heeled, speaking to each other with a soft voice. In this BCBG (Bon Chic, Bon Genre approximately translatable to Good Tastes, Good Manners) establishment, chef Alain Solivérès proceeds with a stealthy tread. He discretely brought with him some accents from his native South such as a risotto with épeautre (a rare kind of wheat) accompanied by girolles mushrooms, a langoustine ravioli, a roasted lamb with gnocchi and a Saint Pierre with basil. Not a revolution, just a quiet step into the contemporary trends that does not send shock waves across the tables. Choose from the à la carte menu or preferably from the dégustation menu --- €218 is a good value for such a place and its across-the-board quality (€88 or €104 with the wines at lunch). With more than 2,000 offerings, the celebrated wine list, resulting from the work of Marco Pelletier, is just astounding. Many superb wines are available by the glass. Visit also the associated wine shop, Les Caves Taillevent, nearby. The service is as polished as it gets.